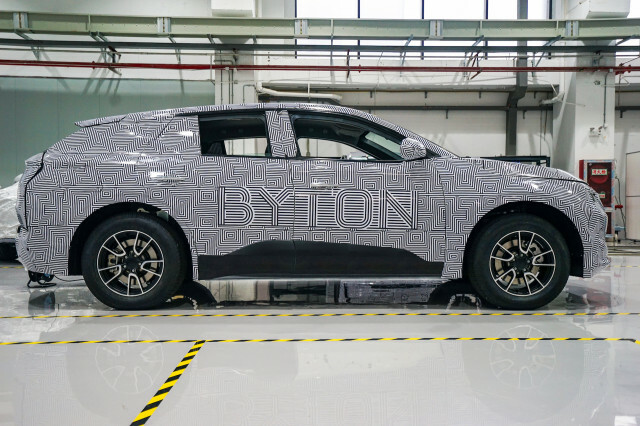 Chinese electric car startup Byton is about to begin road test with their first ever crossover SUV. The vehicle which will be introduced sometime next year in China will also become available in Europe and the United States in less than two years as the 2020 Byton M-Byte. After that, the company has a plan to introduce a K-Byte sedan in 2021, as well as a large seven-seat SUV before the end of 2022. But let’s go back to the M-Byte, shall we? Although the automaker has not revealed everything about the upcoming vehicle, the compact electric crossover promises to be highly competitive even now. According to preliminary reports, the base M-Byte electric crossover will be paired with a 71-kilowatt-hour battery pack and an electric driving system that’s going to provide 250 horsepower and 295 pound-feet of torque. By using the powertrain, the 2020 Byton K-Byte is going to able to travel around 249 miles on a single charge. The model will reportedly cost around $45,000. The company plans to add a more expensive model which will rely on a bigger battery and will provide more power. More precisely, the topping version of the K-Byte will use a 95-kWh battery system that should be able to provide a 323-mile range. The crossover will be equipped with a system that provides 470 hp and 524 lb-ft of torque, though. While the camouflaged prototype reveals a pretty common exterior design without anything too aggressive, the cabin promises to be quite futuristic. The 2020 Byton K-Byte will have a 49-inch-long digital screen that wraps the dashboard. Also, the crossover will get a Level 3 self-driving capability, as well as an artificial intelligence which will reportedly be able to understand the driver’s preferences. Plus, the intelligence will be able to recognize the faces, so there will be no need for any actual key.